Each of the four gospel accounts gives us a portrait of Jesus, His life, mission, and teaching. Each is different in style, length, and emphasis, but they all have a common thread and purpose – the proclamation of the good news (gospel) of Our Lord Jesus Christ, Saviour of the world. “The time is fulfilled, and the kingdom of God is at hand; repent and believe in the gospel.” – (Mark 1:15). Among the four gospels, St. Mark’s account is unique in many ways. It is the shortest account and seems to be the earliest. 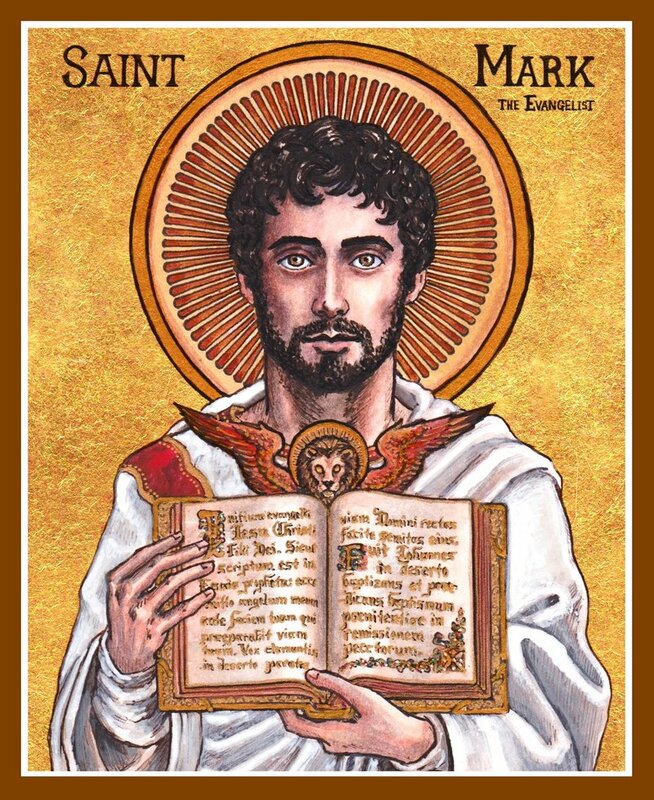 Mark the Evangelist was an associate of St. Peter and wrote his gospel in Rome where Peter was based. He wrote it in Greek and it was likely written for Gentile readers in general, and for the Christians at Rome in particular. It is significant that Mark, as well as Luke, was chosen by the Holy Spirit to write the gospel account even though he wasn’t one of the twelve Apostles. St. Augustine of Hippo, explains: “The Holy Spirit willed to choose for the writing of the Gospel two [Mark and Luke] who were not even from those who made up the Twelve, so that it might not be thought that the grace of evangelisation had come only to the Apostles and that in them the fountain of grace had dried up” – (Sermon 239.1). Mark ends his gospel account with Jesus’ last appearance to the Apostles before His Ascension into Heaven. Jesus’ departure and Ascension was both an end and a beginning for his disciples. While it was the end of Jesus’ physical presence with His beloved disciples, it marked the beginning of Jesus’ presence with them in a new way. Jesus promised that He would be with them always to the end of time. Now as the glorified and risen Lord and Saviour, ascended to the right hand of the Father in Heaven, Jesus promised to send them the Holy Spirit who would fill them with His gifts on the Feast of Pentecost. When Our Lord Jesus Christ departed physically from the Apostles, they were not left in sorrow or grief. Instead, they were filled with joy and with great anticipation for the coming of the Holy Spirit. Jesus’ last words to His Apostles point to His saving mission and to their mission to be witnesses of His saving Death and his Glorious Resurrection, and to proclaim the good news of salvation to all the world – not only to the people of Israel, but to all the Nations. 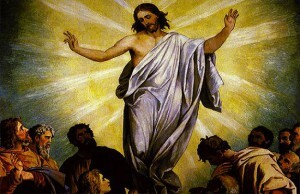 God’s love and gift of salvation is not just for a few, or for a nation, but it is for the whole world – for all who will accept the Sacrament of Holy Baptism in the Name of the Father, the Son and the Holy Spirit and the teachings of Our Lord Jesus Christ, proclaimed in their fullness by the Catholic Church. This is the great commission which the risen Christ, the only Saviour of the world, gives to the whole Church. All believers have been given a share in this task, under the guidance and care of the successors of the Apostles, the Pope, our bishops and priests. We have not been left alone in this task, for Our Lord works in and through us by the power of His Holy Spirit in His Church. We must testify to this “kingdom of God” to others through our faithful witness, our joy in the gospel, and our hope through the Resurrection and Ascension of Our Blessed Lord. I wonder if this blog is going to last much longer? I detect a falling off in its synergy. Earthly endings can be celebrated as well as lamented. Auld Lang Syne, what? I detect an urge by the founders to explore new frontiers. T.S Eliot’s Criterion lasted 17 years. The great traditionalist Catholic monthly Triumph only 9. If CP&S fades away after 6, we who have been enriched by its evangelism will remain grateful. …but, paraphrasing Chesterton, I may be exaggerating the imminent death of CP&S. It’s just that some days we all get soooooo busy in our lives in the world that the blog gets somewhat neglected, and other times we are falling over each other in our eagerness to publish articles on CP&S. Often when I see Mark’s name written I am reminded about just how much our Roman Church is the Church of the scriptures. I suspect it’s true that Mark wrote his gospel for the Christians in Rome and his gospel is that which he heard from Peter and set down in writing. Containing too the tombs of those other two prominent New Testament figures and apostles, Peter and Paul, Rome must be no. 1 on the “scripture-alia” charts, except of course for places in the Holy Land.